Cumulus makes it easy for your workgroup or enterprise to quickly organize, find, share, and track your ever-increasing number of files: photos, logos, presentations, videos, MS Office, Adobe, Quark, or any other digital files. Cumulus is a time-tested cross-platform solution, with over 15,000 Cumulus Servers sold and more than a million user licenses distributed. 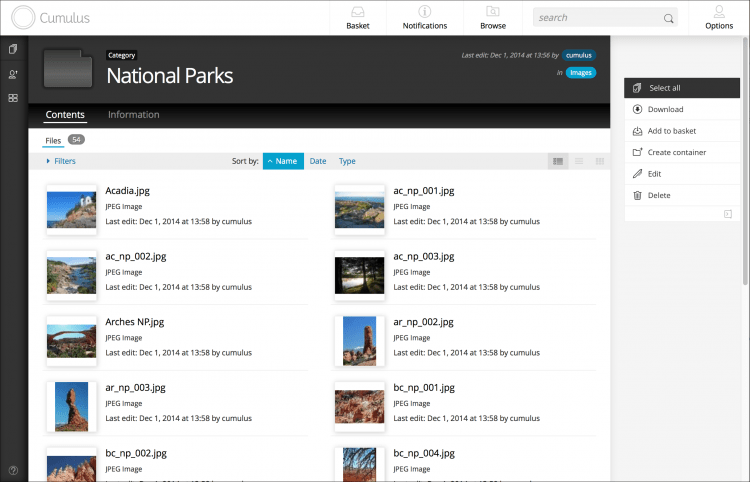 Cumulus makes your valuable digital assets available and searchable by subject matter, author, campaign, product, or any other custom metadata. There’s no limit to the number of files you can manage. Cumulus is based on open-APIs and standards (such as Java and SOAP) that make it exceptionally customizable and easily adaptable to any work environment. This flexibility is enhanced by the most diverse and long-standing developer and value-added reseller community of any digital asset management solution. In addition to offering Cumulus, Modula4 offers products that add important features to Cumulus, plus a complete range of services to help you get the most out of your system. Contact us to learn more about Cumulus, our exclusive features & services for Cumulus, and our DAM cloud hosting.